Despite a rebound in equity markets in the first quarter, the number of listings collapsed year-on-year. Bankers of an optimistic nature are focusing on a recent uptick in activity. That’s not enough to offset a lengthy list of reasons to keep sitting on the sidelines. 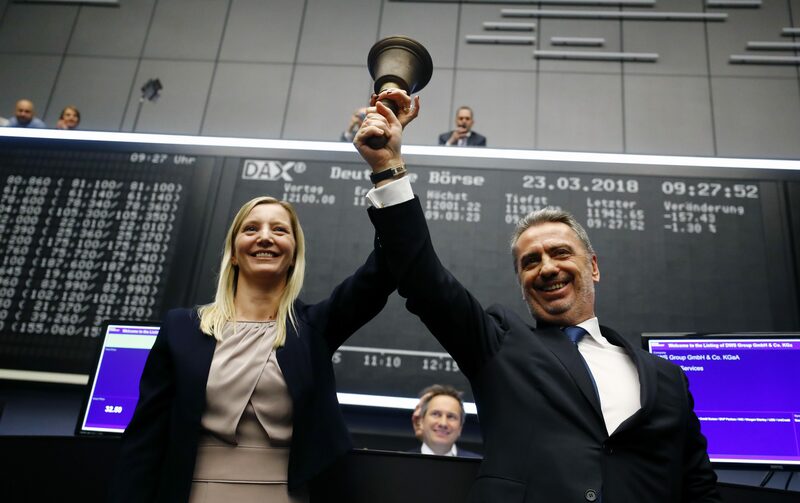 Nicolas Moreau, CEO of Deutsche Bank's asset management unit DWS, and Claire Peel, CFO of DWS, ring the bell to start the share trade for the first time after its IPO on the Frankfurt Stock Exchange, Germany March 23, 2018. Money raised from European IPOs this year, up to April 10, had fallen 82 percent to $2.6 billion compared with the same period in 2018, according to Refinitiv data. Sharp declines were seen in equity capital market proceeds across Asia, the Americas and Europe. A pan-European index of shares, the STOXX Europe 600, has risen 17 percent from two-year lows late last year. As of 0930 GMT on April 16, Nexi was trading 6.5 percent below its IPO price of 9 euros a share. Network International was 15.2 percent higher than its IPO price of 435 pence.